It's no secret that native biodiversity is on the ropes, in the Northwest and around the world. And because we frequently care so deeply for the places and species that we love, we tend to make conservation decisions with our hearts but not our heads. I don't believe for a moment that passion isn't important for conservation, but better information about the most severe threats may be even more important. So it's a good first step that a number of conservation scientists recently published an roster of 794 species that are not only on the brink of extinction but, even worse, are hanging on in only a single location. By mapping these critical places--there are 595 of them--we can get some sense about where to direct our conservation resources in order to protect species from vanishing altogether. Of course, this map, and other biodiversity "hotspot" maps shouldn't be the last word in conservation decisions. A number of other factors must be included in the accounting. 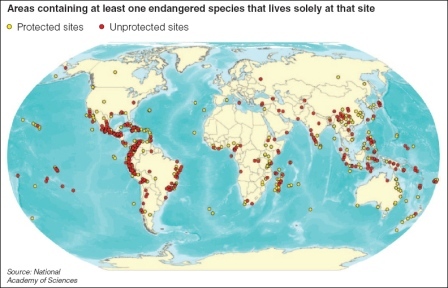 Among them, how likely (or capable) is the host country of actually protecting conservation areas? Are there distinct evolutionary lineages that are at risk? Is it very expensive to conserve land in some areas? Is it possible to protect entire intact landscapes in some places and not others? And there are many more, I'm sure. In case anyone's wondering, that circle in Cascadia represents the Vancouver Island Marmot. For more information on the report, check out the Alliance for Zero Extinction. They're the driving force behind it.